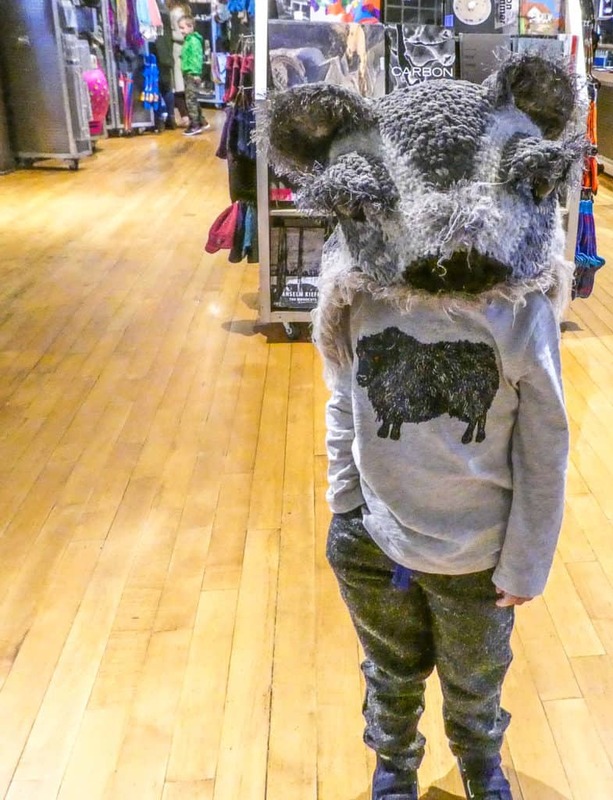 There’s a reason why MASS MoCA should be on your family’s bucket list. MASS MoCA is not your typical museum. The Berkshires offers a scenic New England weekend like no other; the concentration of cultural experiences amidst breathtaking scenery is the reason why I have been a regular to this area for over thirty years. The “Brooklynization” of the Berkshires has shifted the landscape of the area since the 1990’s, but it has only made it an increasingly family-friendly destination. MASS MoCA is one of the most interesting cultural efforts to revitalize a post-industrial New England town. MASS MoCA consumes 16-acres of repurposed brick mill buildings in North Adams that began life in 1905 as a factory that painted fabrics and later served as an electronics company from 1942 until 1985. North Adams’s neighbor, Williamstown, is home to Williams College. For a tiny liberal arts school, Williams, is a powerhouse in the art world with two world-class museums (the Williams College Museum of Art and The Clark Art Institute) in a town with a population under 8,000. When Thomas Krens was the director of the Williams College Museum of Art, he desired larger installation space for pieces that wouldn’t fit in traditional galleries. Shortly after the project began, he left Williams to become the director of the Guggenheim Museum in New York and is currently overseeing the development of the Frank Gehry-designed Guggenheim Abu Dhabi. Joseph C. Thompson, also from the Williams College Museum of Art, was appointed the new director of MASS MoCA. 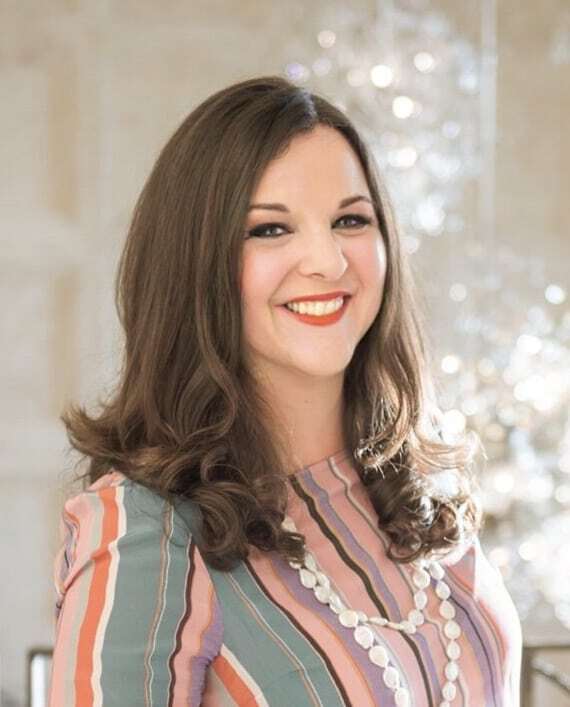 The art, state, and philanthropic communities persisted and opened its doors in 1999, with Thompson still serving as its current Director. There are more than sixteen buildings within MASS MoCA ideal for larger installations that would fit in few other places in the world. The scale of the work is intriguing enough to engage children who might not appreciate museums with traditional art collections. 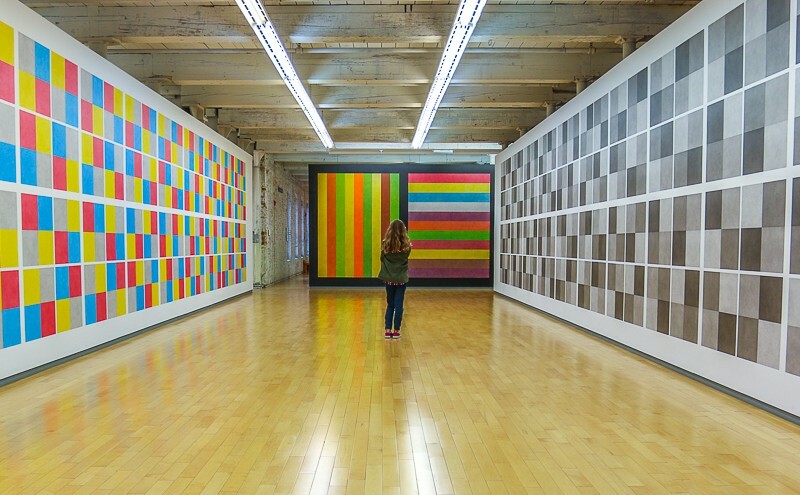 In our few hours, we focused on Sol LeWitt’s black and white and brightly colored murals which are on view until 2033. 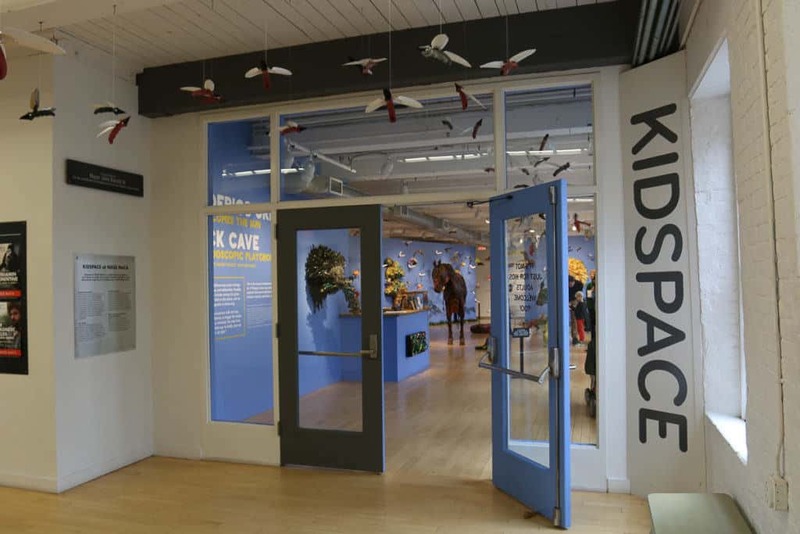 Take the John Cage-Merce Cunningham Bridge to access the space, which is conveniently near the Kidspace entrance. This audio installation conveys to children quickly that art can be a multi-sensory experience. The audio track is on a very long loop, so your kids will want to run back and forth for a while. Take turns walking the bridge with eyes closed while your kids guide you to help focus on the sounds you hear, and then switch and do the same for your kids. The Sol LeWitt exhibit is a multi-story retrospective where more than 60 artists and art students rendered the works on more than one acre of wall space. This was an unprecedented project in collaboration with both Yale’s and Williams’ museums. 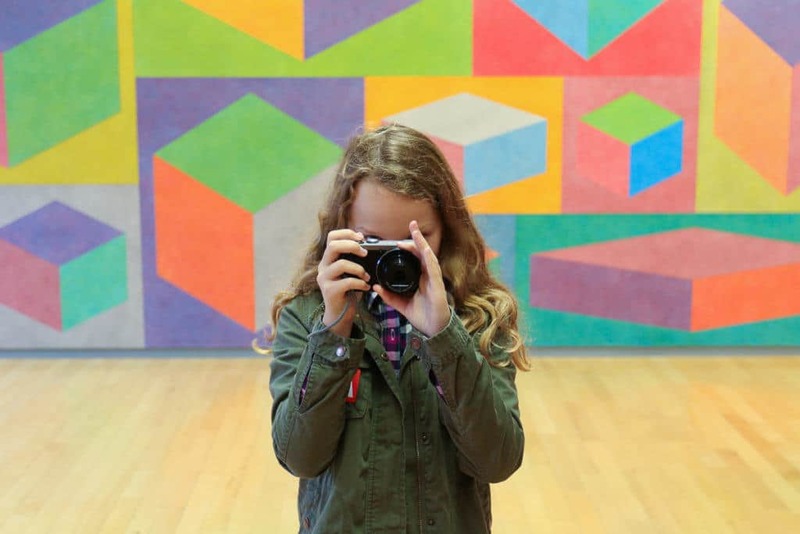 I gave my daughter a camera to inspire her to look more deeply at the Sol LeWitt works and to focus on how they lived in the space together, which really helped keep her interest. Trust me, not all museums are this easy for me to engage my kids. We are known as the chocolate-croissant-bribing parents dragging our children through museums or historic homes. MASS MoCA does all of the work for me. Hurry! The Sol LeWitt exhibit is on view until 2033.
well-traveled parents advise one another. 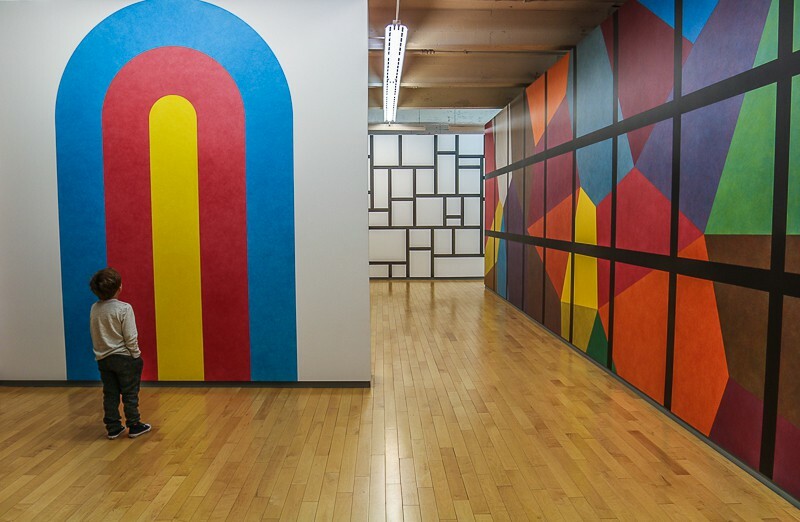 A Luxe Recess contributor and her family had been so taken with this exhibit, too, that she and her family reached out to the Sol LeWitt Foundation and had a work installed in their home’s stairwell. Over the course of the month, her children were actively engaged in the process, too, and they brought their MASS MoCA experience home. Now they can never move. Kidspace is an incredibly conceived children’s area that offers art experiences ideal for every age. It is an ideal first art museum for families who are weary of taking their children to a museum. Parents can find easy conversation to discuss the colorful works in the room from early walkers to teens. Welcome to the gallery of Kidspace inside MASS MoCA. Federico Uribe’s sculptural animal garden engaged both of my children in deep concentration. Each animal was made with a repurposed item, like tape measures, discs, or bullet shells. 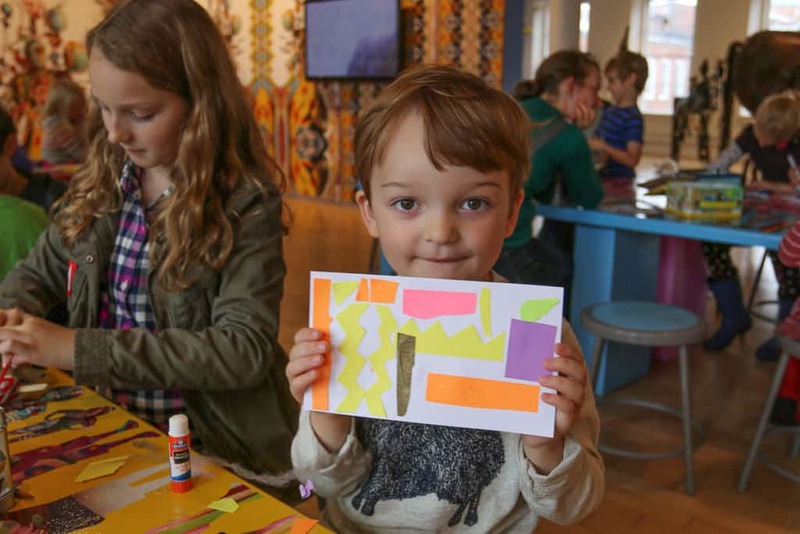 Kidspace is an exceptional children’s activity area at MASS MoCA that offers sophisticated art projects for the youngest visitors to create. After choosing which project they’d like to make, the museum staff members give children a vintage lunchbox filled with the required materials to go sit art tables and leave with handmade souvenirs. There were options perfect for preschoolers as well as older children. Sunday is the key day for foodie families to visit because the Kidspace is open, and Gramercy Bistro, the upscale restaurant on site, serves Sunday brunch. The signature dessert at Gramercy Bistro in MASS MoCA. Gramercy Bistro doesn’t offer an official kids menu, but we easily found plates of grilled chicken, French fries, and bowls of minestrone to satisfy them. Had my kids not already had a big breakfast, they would have been happy with the house specialty of Dutch-style pancakes. 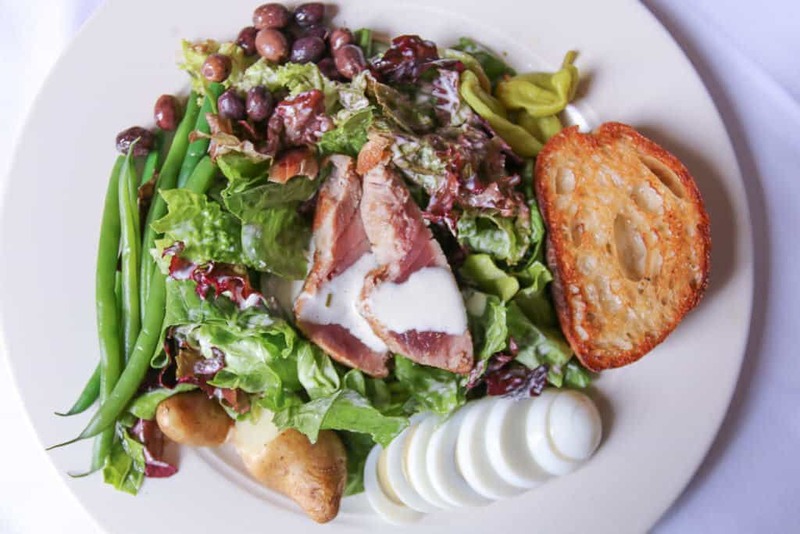 My Niçoise salad would have been perfect if it had more tuna and fewer olives. The desserts are excellent and worth a bribe to get an extra hour in the galleries before a meal. 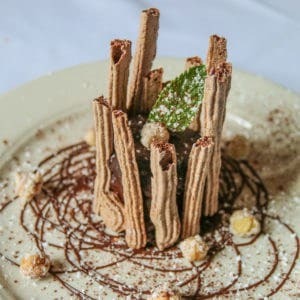 Pastry Chef Lindsay Bleau’s signature dessert is a very vertical chocolate cake made into a tower supported by chocolate meringue sticks and candied hazelnuts. Inside, a molten chocolate cake delivered the fudgey treat everyone was waiting for. It was perfection. A fruit crisp contained just the right amount of sea salt in its oat crumble topping to contrast the sweetness of the fruit. Within the massive museum complex, families will enjoy a great gift shop, coffee house, and the MASS MoCA’s main cafeteria. Although we didn’t eat there on our visit, it looked quite good and very popular with a large crowd. The gift shop at MASS MoCA. 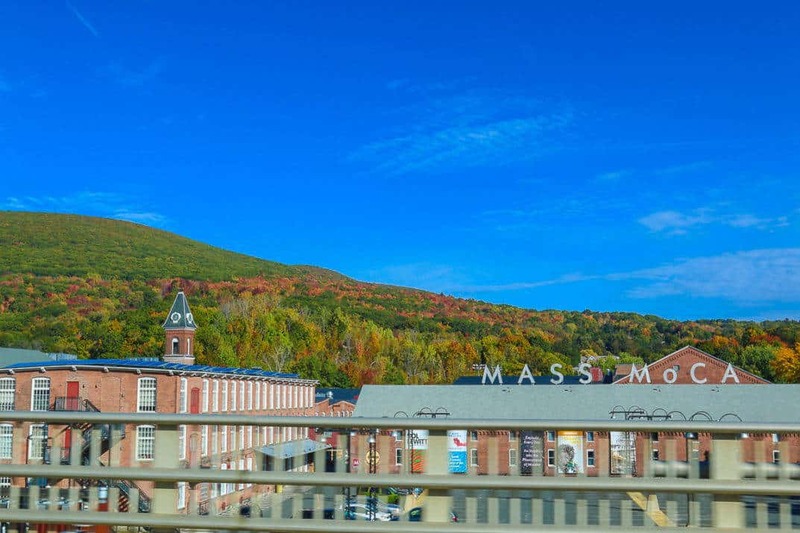 Where will the urban dwellers making a pilgrimage to MASS MoCA stay? An unprecedented museum project needed a hotel worthy of its ambitions. 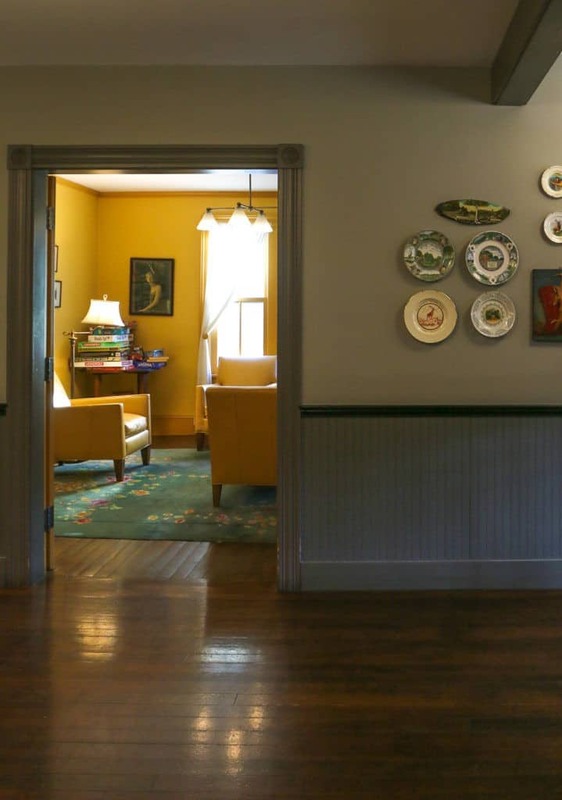 The concept was championed by two MASS MoCA board members: Jack Wadsworth, an alumnus of Williams, and Nancy Fitzpatrick, owner of the Red Lion Inn of Stockbridge. The vision behind the Porches Inn was to gut and restore row houses across the street from MASS MoCA that were inhabited by the area’s millworkers. Behind the row houses is Building 7 next to the pool which has a social area and sauna. 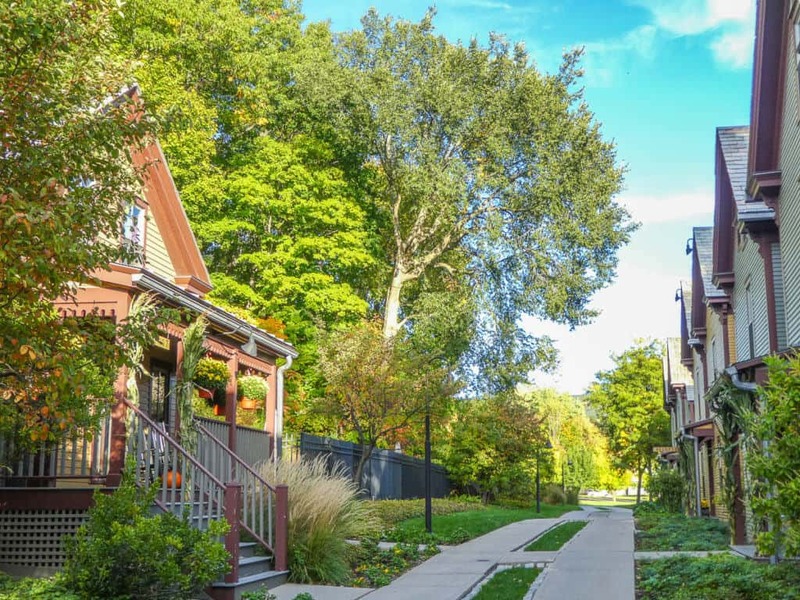 Compared to so many bed and breakfast in the area, Porches stands out as one of the best family-friendly choices for its spacious suites, many of which are bi-level with spiral staircases and two bedrooms. With its walls, beadboarding and molding painted like a Farrow & Ball catalog, and curio cabinets filled with flea market tchotchkes and an abundance of irony, Porches opened in 2000 as a trendsetter in hospitality design. Hundreds of boutique hotels and restaurants have opened since copying this style. Rooms are adorned with Company C rugs and Pottery Barn-style slipcover furniture, feeling much like a chic studio apartment. Bathrooms are particularly inviting with separate showers and tubs all in gleaming white and chrome, and rooms are decked with fancy technology, Apple TVs and Tivoli stereos. A charming parlor area offers stacks of board games. My son immediately made friends with the hotel kitty who reigned supreme in the light of the sunny windows facing Mass MoCA across the street. Other amenities on site include a fitness center, sauna, and a heated outdoor swimming pool and hot tub. The pool area is paved with radiant heated stone to keep it comfortable well beyond Tanglewood season. A pop up hotel gift shop offers quirky and eclectic gifts for adults and children. 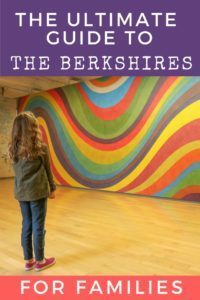 Even with the pool, board games, and spacious suites for families, the Berkshires offers so many things to do, parents will be with their kids at Mass MoCA, driving or hiking to the top of Mt. Greylock, and exploring the area more than in their rooms. Pin to plan your family vacation in the Berkshires! Porches doesn’t offer room service, but a buffet continental breakfast is included. Breakfast is served in two different rooms. One is adorned with chalkboard walls that doubles as the hotel’s conference room. Young children who found pieces of chalk before breakfast adorned the walls with lotus flowers and seven-year-old versions of “Kilroy was here.” Outside of the standard carb buffet, the breakfast options included oatmeal, cereal, hard boiled eggs, and cheese. 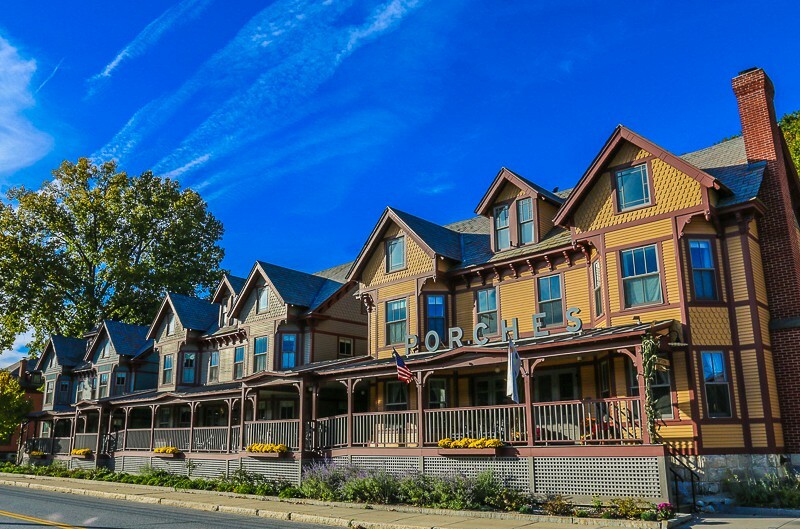 Porches is part of the Main Street Hospitality Group which owns the newest Hotel on North in Pittsfield as well as the Red Lion Inn, the classic Stockbridge inn, known—of course—for its porches. 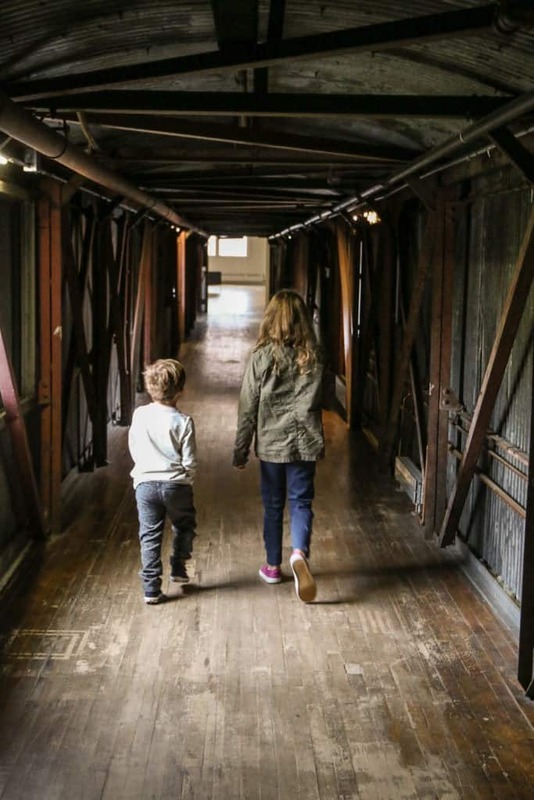 If I were a local, I would be at MASS MoCA with my children a few times a month because of its extensive offerings for families and the vastness of the collections, but I sadly would lack the excuse to check in at the Porches Inn. Although we were guests of the Porches Inn at MASS MoCA, these opinions are entirely my own. Check rates at the Porches Inn. Check out our review of the Cranwell Resort in Lenox as another family-friendly property we recommend in the Berkshires. Yes, it is a perfect stop if you want to visit Boston and New York. It is an area that shows some of the best in American culture, so it is a MUST! This sounds like such a fantastic place – I think we’d really like it. I especially like the idea of the special kidspace, and the audio installation. Brilliant that you had to drag your kids away! Wish we were nearer to come and see it for ourselves…. I love the multi-sensory aspect of the museum. I know my kids would love a visit! The Berkshires looks lovely. I can’t wait for a chance to visit. 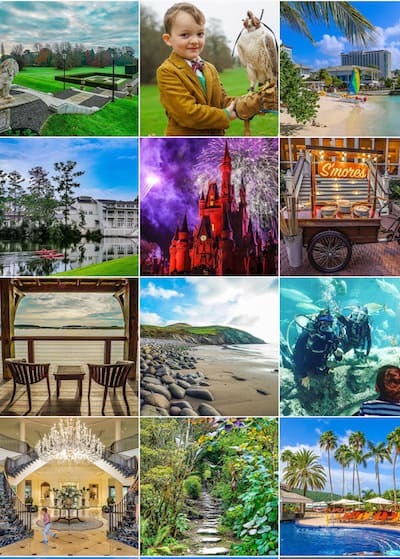 Love your colorful photos! The Berkshires look fabulous. 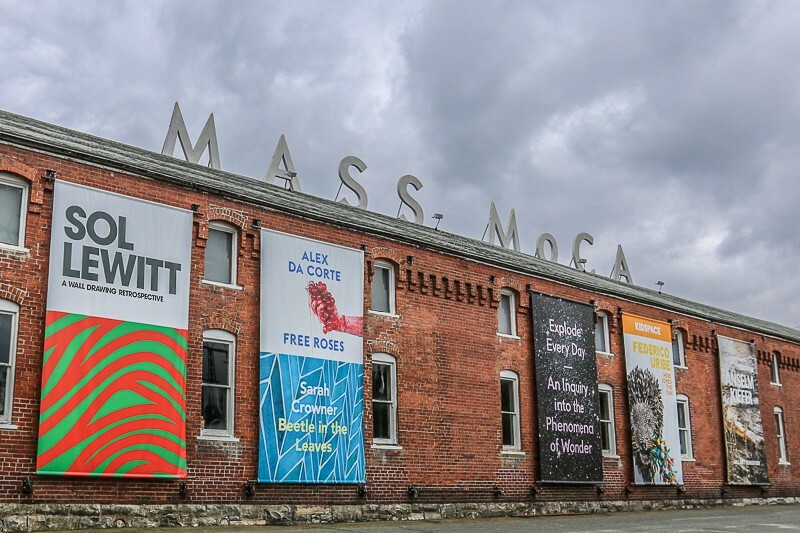 This is such a great guide to MASS MoCA! I live nearby and visit often with my kids. I was totally taken in by your stunning photos! I guess I have to plan a trip to the Porches now. What a beautiful place! Thank you so much! You are very lucky to have it nearby. Their extensive programming is amazing.